Best of luck to the county U21 football team and especially our club men, Conor Cashman, Mikey O Connor and Brian McKenna, who are part of the panel for Tipperary's first match on Wednesday next V Limerick in Limerick. 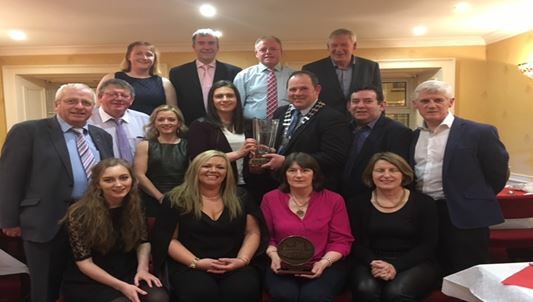 Well done to our Intermediate Camogie team who picked up another award at the weekend, this time from the Cahir & District Sports Achievement Awards committee, who voted the team the overall winners for 2016, the night was held in the Shamrock Lounge with guest, our Mayor Andy Moloney, a great night was had by all and the awards committee chairman Gerry O Donnell was happy with the event which he said was a great success (pictured below are the committee members, Deputy Mattie McGrath, Mayor Andy Moloney presenting Carol Keating and ( in the front row ) members of the Camogie Club with the overall winner's trophy also in the picture is Hughie Donoghue Shamrock Lounge. March 11th is pencilled in for the annual Liam Kiely tournament held in Cahir, when hurling teams from around the area come together to play in this great sporting day, as usual the Kiely family sponsor the trophy's etc. as you can see by the name of the event it is to remember one of our fine young men taken from us far too soon Liam Kiely RIP. 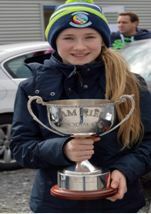 Pictured is Liam's niece, Rosanna Kiely with the memorial trophy which is held by last year's winners Cahir GAA, SO keep that date free and come along and enjoy a good family day of hurling and banter. Congratulations to Fiona Flynn Cahir who won €500 in the county draw held last Friday night, unfortunately we had only the one winner from our club but one is better than none , spend it well Fiona. Bridie and John Kendrick (the Abbey Tavern) were our host's for our weekly fun game Last Sunday evening, thank you all for your continued support as this is our main fund raiser and it is very much appreciated. The winners are as follows: Mary Hanrahan, Larry Quinn, Conor Cantwell, Martin Hanrahan and Tommy Barrett. Don't forget guy's STARS IN THEIR EYES CAHIR TICKETS ON SALE NOW DON'T LEAVE IT TOO LATE CAUSE THEY will SELL OUT FAST.